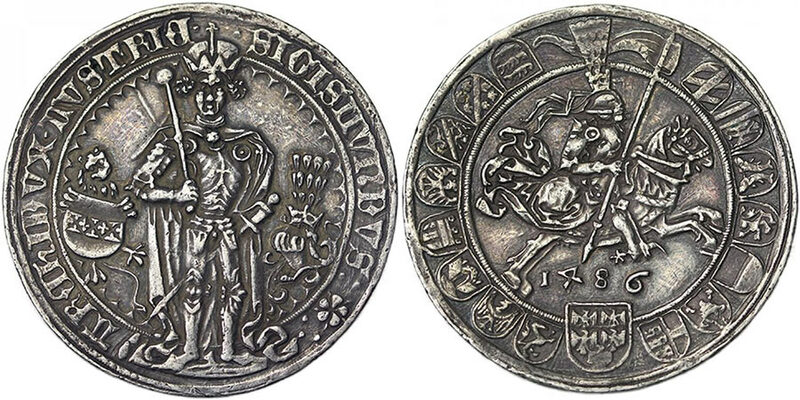 Sigismund, Archduke of Austria (1439-1490) Thaler 1486 Hall mint, The first Thaler of the World, usual slightly smoothed fields. Strong strike with high details. Rare in this condition. Ø 41 mm MT 64 Dav 8087. 31.69 g. R XF (started at 3k Euro + fees. In the Habsburg lands it was not only salt mining and trading that were important branches of the economy. The entire mining industry boomed from the late Middle Ages on: by 1520 there were some 50,000 people employed in silver mining alone in Schwaz in Tyrol. Archduke Sigismund of Tyrol and his successors, the Emperors Maximilian I, Charles V and Ferdinand I, who granted the mining regions a number of privileges, certainly knew how to make use of the blessings of Tyrol’s mountains. Sigismund stopped delivering silver to Venice for the production of coins. Instead he stamped his own coins in the newly established mint at Hall, which is near Schwaz. The ‘Tyrol pounders’ (Tiroler Pfundner) which were minted there had a special feature: they were the first coins in the German-speaking countries which bore a realistic portrait of the country’s ruler. Moreover, the mint at Hall used new techniques which improved the production and the quality of the coins made there. As kings or emperors of the Holy Roman Empire and at the same time as the sovereign princes of Tyrol, the Habsburgs mortgaged or leased more and more of their sovereign rights to the mining and sale of silver to private entrepreneurs like the Fuggers. At the same time the entrepreneurs and traders developed the practice of selling silver which had not yet been mined for bills of exchange or cash, with two-thirds of the silver mined and sold being exported. Trade in this ‘virtual’ silver became a problem when, towards the middle of the sixteenth century, the profit-making deposits began to be exhausted and silver which had already been sold could not be delivered on time or indeed at all. Mining ore less rich in silver was also far more expensive. This, together with wars and the resulting price rises, the conflicts between the Protestant and Catholic powers in Europe and the consequences of epidemics, led to a crisis in the mining industry in Schwaz.